Whether it is a holiday party, a get together or a family dinner, people’s favorite part of the meal is often the appetizers. Have you ever noticed that people always congregate around the appetizer table? 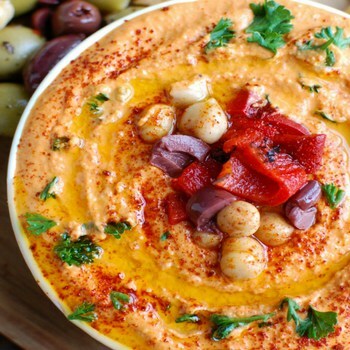 This Roasted Red Pepper Greek Yogurt Hummus is a colorful, healthy addition to the spread. It is packed with flavor from the fire roasted red peppers and has added protein and calcium from the Greek yogurt. Do you see that vibrant, beautiful red color of the hummus? 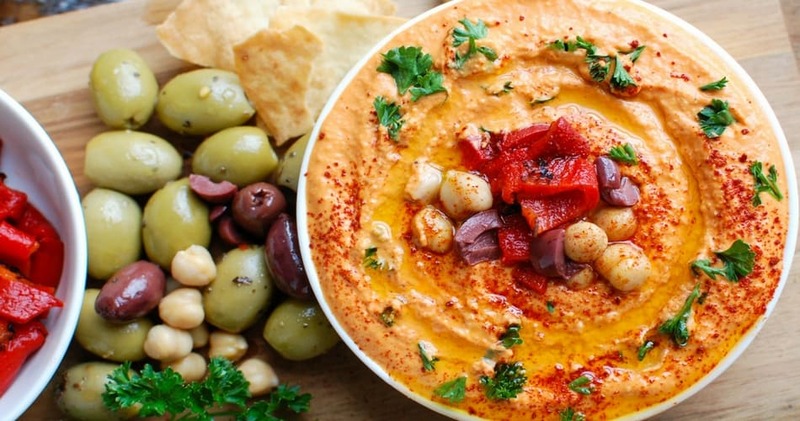 This hummus recipe uses fire roasted red peppers in this recipe, and I just love the color it created. Pair this hummus with a plate of cucumbers, and you have a festive red and green appetizer. I also love it with fresh pita and fresh vegetables. If you aren’t feeling the fire roasted red peppers, you can use regular roasted red peppers or leave them out. Hummus tastes great in its traditional form with a sprinkle of paprika, fresh parsley and olive oil. If you are wondering what it tastes like to add Greek yogurt to hummus, it doesn’t alter the taste but does help create an even creamier, richer dip. It also is a good way to add additional protein and calcium, too. Greek yogurt is a great ingredient to use in place of butter, sour cream, heavy cream, or even in your favorite salad dressing, to lighten up recipes and cut calories. Six ounces of Greek yogurt typically contains 14 to 17 grams of protein. If you plan to make this hummus for the holidays or larger gatherings, I suggest doubling the recipe for a big group. This stuff goes fast, trust me! When I do my meal planning for the week, I always make a double batch of hummus to use for the week for snacking and as a spread on wraps and sandwiches. Put the all ingredients except the olive oil into a food processor. Blend the hummus for 30 seconds. Add the 1 tablespoon of olive oil and continue to blend until you reach the consistency you want. Test and adjust seasoning and add salt if you desire. Serve the hummus in a bowl and garnish with fresh parsley, olives, chopped roasted red peppers and olive oil. Serve with pita or vegetables. Notes: You can adjust the olive oil by adding more to make the hummus thinner if you want. My name is Julia, and I am a busy mom of three boys. We recently relocated to Cleveland, Ohio from Chicago, Illinois and I have a deep love for the Midwest. With three energetic boys come hungry bellies, so on On A Cedar Spoon I share healthy, quick and easy recipes for the whole family with the kids in mind. 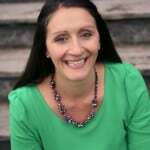 I am a recipe developer, nature lover, traveler and Mediterranean food lover. I love incorporating fresh, seasonal flavors and ingredients along with rich, warm spices into my cooking!